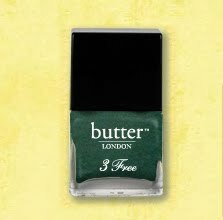 3 Free Lacquer in British Racing Green: A gorgeous hunter green that was originally used backstage at Vena Cava during Fashion Week. 3 Free Lacquer in Rosie Lee: A pretty pink sparkler! 3 Free Lacquer in Stroppy: Part of the Jelly collection, this is a beautifully rich grape. 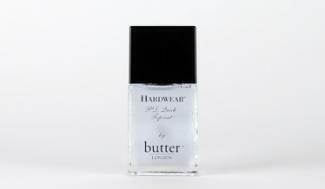 Hardwear P.D. Quick Topcoat: Protects the layers of colour beneath it, and gives a super-shiny finish. Nails look wet, vibrant and freshly painted even when they are dry. Nail Foundation Flawless Basecoat: This treatment hides and smoothes tiny ridges and imperfections in the nail. It's like foundation for the nail and leaves a silky, matte finish when used alone. To enter, place your name and email address in the box below. The winner will be selected on Sunday, August 22 and notified by email. This giveaway is open to US residents only. Giveaway runs until Saturday, August 21 at midnight. One entry per person, email address and IP address. Multiple entries will be disqualified.